A Dark Shadow Biosphere with Unorthodox Orthogonality? In the first post of this series dealing with so-called biological dark matter , I noted that while the discovery of an extraterrestrial alien biology would certainly qualify in this department, it is quite conceivable that one does not need to venture beyond the bounds of this planet to encounter biological forms dramatically distinct from those now familiar. The possibility of such ‘weird life’ is the theme of this post. There is overwhelming genetic evidence that all living organisms on Earth, ranging from bacteria and oak trees to mushrooms and humans, share a common evolutionary ancestry. In other words, all living forms can be traced back to a hypothetical common cellular progenitor in the remote past, most often referred to as LUCA (for Last Universal Common Ancestor). By the same token, if life originated on an extraterrestrial planet in a completely independent manner, there would be no reason to expect any such evolutionary similarity. Indeed, such alien life might exhibit fundamental differences at the biochemical level, and in its means for replicating itself. But in recent times, it has been pointed out that the sharing of fundamental biological mechanisms by all living organisms on this planet does not necessarily imply that other quite different biosystem ‘experiments’ failed to occur during the early stages of the origin of life. Indeed, it superficially seems plausible that our known and familiar life-systems emerged as the victors of an early stage of competition between various alternatives. Unfortunately, there is too much ignorance of the mechanism of abiogenesis (the origin of life from non-living components) to have any confidence on this point – it could equally well be proposed that (at least under the environmental conditions of the early Earth), the central biosystems familiar today were the only possibility, or at best one possibility from a limited range of very similar variants. Nevertheless, the concept of completely independent evolutionary lineages on Earth has led to a striking idea, promoted in large part by the prominent physicist and author Paul Davies (References & Details). He and colleagues have suggested that utterly distinct life arising from an independent evolutionary pathway may still exist on Earth in a hitherto unrecognized ‘shadow biosphere’. Obviously, there is no prospect of finding ‘shadow animals’ walking around in full view, or anything else so remarkable on a macroscopic scale. It is only in the domain of microbial life that this prospect can be considered, and it is certainly very far from absurd. This hypothetical shadow world could be literally all around us, but unseen and unperceived in the absence of the right tools to reveal it. Davies and co-workers have discussed in some detail what kind of ‘signatures’ a shadow biosphere might leave, which could be potentially analyzed by appropriate measures. With such information it may become possible to gain a foothold into this obscure (but mightily interesting) domain, if it should exist in the first place. Before proceeding further, let’s use some convenient labels noted in a previous post as abbreviations, to avoid tiresome repetition. Here ‘Life-1.0’ denotes conventional known biology and its component biosystems; ‘Life-2.0’ denotes ‘weird life’ with an independent evolutionary lineage. Clearly, if Life-2.0 is possible, then a mutually independent Life-3.0 may also be feasible, and so on – but this need not concern us further here – one precedent will be enough for now! In practice, there could be degrees of separateness of Life-1.0 and hypothetical Life-2.0. Even if Life-2.0 had (by definition) no common cellular ancestry with Life-1.0 (that is, no shared LUCA), it could in principle share certain features arising during early molecular evolution, such as informational nucleic acids. The degree of divergence could even predate this, or the biochemistries of the two life-types might have no shared history at all. One of the key points raised by Davies and his collaborators has been the ecological / environmental arenas where Life-2.0 might be found, in relation to normal Life-1.0. There are three formal possibilities in this respect, depicted in the figure below. 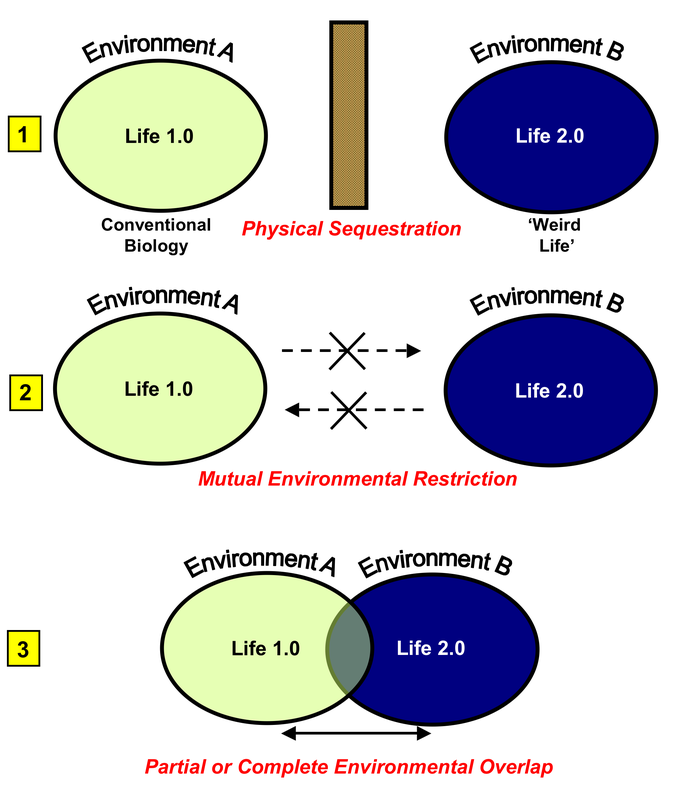 In the first condition, ‘Physical Sequestration’, the ecological domains of Life-1.0 and -2.0 simply are physically separated in such a manner that no contact between the two is possible. This if course would be the state of affairs if the two types of life were divided by vast gulfs of space and time, as would be the case for living biosystems emerging independently in different parts of the universe. It is worth mentioning in this context that for this true condition of independence to arise, it might be necessary to restrict consideration to extrasolar planets. For example, it is still an open question as to whether microbial life exists (or once existed) on Mars, but even if so, it is by no means certain that such life would necessarily warrant the ‘weird / 2.0’ distinction. This doubt stems from the known frequent exchange of material between Mars and Earth by means of meteoric activity, an effect also discussed by Paul Davies in one of his popular books. A consequence of this exchange, given the known toughness of micro-organisms in surviving extreme environments, is that life originating on either planet could in principle by transported to the other by the vector of an ejected planetary fragment resulting from meteoric impact . All such questions are resolvable, if and when a ‘Mars bug’ is obtained by terrestrial molecular biologists for laboratory scrutiny. But these considerations might well prompt one to ask, “If even the space between Earth and Mars may not be a physical barrier, how could any environments on Earth remotely conducive to life be completely sequestered from each other for eons?” (This separation would certainly have to be maintained for many billions of years, to precede the development of LUCA for Life-1.0). Given Earth’s ceaseless geological activity of plate tectonics and vulcanism, the answer might well be, “No, they could not.” But since conventional (albeit extremely hardy and unusual) organisms can exist in surprisingly challenging environments at considerable depths in the Earth’s crust, it might be formally possible that isolated ecosystems of heat-loving Life-2.0 organisms from the earliest times of molecular evolution persist in deep, trapped pockets undisturbed by Life-1.0 interference. In the second possibility depicted in the above figure, it is unnecessary to invoke physical separation, since in this scenario the environments favored by Life-1.0 and –2.0 are mutually incompatible. In other words, what Life 1.0 can tolerate, Life-2.0 can’t – and vice versa. But Life-1.0 has proven to be very versatile in the environmental scope it can adapt to, with some amazing examples provided by microbial ‘extremophiles’ thriving in a range of seemingly inhospitable conditions of heat, cold, salinity, acidity, alkalinity, and barometric pressure. So if Life-2.0 is found in a place where 1.0 cannot go, it would indeed have to be in the most ‘ultra-extreme’ habitats. This can be put forward as a testable hypothesis, where samples from appropriate environments beyond the pale for any known conventional life are screened for evidence of remaining microbial activity suggestive of Life-2.0. (Of course, one would have to exclude the distinct possibility that any such detected ‘ultra-extreme’ life was not simply a novel case of unusual, but conventional, Life-1.0 microbes adapting to even harsher conditions than previously believed possible). Since we have no other biosystems to evaluate beyond those encompassed by the existing overall Life-1.0 paradigm, it cannot be ruled out that some completely independent biological arrangements might have inherently superior adaptive qualities towards environmental extremes, although neither is there is any evidence supporting such a possibility. But there is a more significant problem to consider with the ‘ultra-extreme’ Life-2.0 scenario, if it was effectively restricted to such environments. Were this to be so, one would have to only propose not only that Life-2.0 has properties which enable it to evolve and prosper in such environments, but also that is unable to effectively colonize less severe ecological niches. For the latter to be the case, either Life-2.0 has some kind of limitation which prevents the evolution of forms favoring milder environments, or it is completely unable to compete with Life-1.0 already existing in the less demanding habitats. The first ‘evolutionary limitation’ possibility seems intrinsically quite unlikely – it is adaptation towards extreme conditions which places the greatest challenges on biosystems, not the other way around. In the ‘failure to compete’ alternative, whenever a Life-2.0 variant emerges with properties favorable to growth in moderate conditions, it is swatted down by vigorous Life-1.0 competitors. This is much more feasible in itself, but does not strike me as an obvious, automatic proposition, given the immense versatility and resilience of the biology that we do know about. If Life-1.0 and –2.0 can tolerate each other’s environmental preferences (or at least a subset of them), then the third possibility emerges, where Life-2.0 could indeed be literally ‘under our noses’. In this case, samples from ordinary environments (such as soils) might harbor exotic Life-2.0 organisms as well as the normal teeming complement of ‘regular’ bacteria, fungi, algae, and protists. How could you tell? A huge range of conventional bacteria are rod-shaped and indistinguishable by simple microscopic observation, despite radically different genomes and metabolic activities. So in principle, when looking down a microscope at a mixed population of soil bacteria, one might be eyeballing some weird (but rod-shaped) Life-2.0 exotica, yet never know it. And in order to study microbial organisms, it has classically been essential to grow them, but regrettably only a small fraction of conventional organisms in soils (and many other environmental sources) are amenable to growth under defined laboratory conditions. If even Life-1.0 bugs can stubbornly and routinely refuse to grow in the lab despite much coddling with known cofactors and supplements, how could one expect to grow their hypothetical Life-2.0 counterparts, whose nutritional requirements are by definition wholly undefined? To some extent, metagenomics (noted in a previous post) has circumvented the growth problem for the analysis of non-cultivatable conventional cells, but it is doubtful that a card-carrying Life-2.0 organism’s genome (whatever its nature) would be amplifiable in same way as for the DNA genomes of normal organisms. Is this quest then hopeless? Not at all, but to have any reasonable prospects of success, it is very useful to make some kind of model as to the nature of the sought-after ‘dark matter’ Life-2.0. Make a prediction of how a particular category of alternate life might behave and use this as the basis for your screening and evaluation process. As one example, let’s briefly consider a recent case which has received plenty of publicity…. It is beyond the scope of the present post to rehash the arguments around this work, but it is worth raising a point made by Steven Benner, who was a co-author on the ‘shadow biosphere’ paper (along with Paul Davies, Felisa Wolfe-Simon and others) but not the GFAJ-1 publication. Benner noted that the chemical instability of arseno-diester bonds rendered the biologically useful incorporation of arsenate into a DNA backbone a difficult proposition, unless some unprecedented stabilization mechanisms existed within GFAJ-1 cells. Even if the latter is true, though, it is difficult to account for the apparent ordered migration of GFAJ-1 genomic samples during in vitro gel electrophoresis (as presented in the relevant Science publication), where any arseno-diester bonds would be expected to undergo quite rapid hydrolysis. But this still remains to be clarified…. In any case, whatever the final nature of GFAJ-1, it is clearly not a member of Life-2.0, but (at best) a very atypical representative of Life-1.0. Even as a biological outlier, it interacts heavily with the conventional biosphere. This question of interaction has a direct bearing on hypothetical Life-2.0 of the third ‘shared’ class in the above Life-demarcation figure. If both life-types utilize the same environment, how much influence would they exert on each other? Another way of expressing this is to ask whether Life-2.0 could thrive while completely orthogonal to Life-1.0 in the same ecosystem. To explain further…. Simply expressed, an orthogonal reaction or system is one that operates in a manner which does not interact with another particular reaction or system. Or in other words, a reaction or system A is orthogonal to a reaction or system B if A conducts itself in a manner independently of input or influence from B. The concept of orthogonality finds conventional expression in various scientific contexts, such as the evaluation of new drug candidates. During successive rounds of such drug screening, it is desirable in principle to use more than one assay, whose functional read-outs result from processes which are orthogonal to each other, to reduce the likelihood of false-positive results. This can usually be arranged even if a drug elicits only one major pharmacological action. As a specific example, consider a compound which enhances the expression of a protein through activation of its gene transcription. In such a case, the activity can be monitored at the levels of gene promoter activity, mRNA levels, or directly by assessing specific protein – all of which use independent (orthogonal) measurement techniques. As another example (this time from the field of chemical biology), numerous applications of facile chemical reactions which are ‘bio-orthogonal’ can be envisaged. Here the aim is to ensure that chemical reagents transported to sites within living cells will specifically react only with each other, and not with any other biomolecules. Although this kind of orthogonality might seem like a tall order, a number of options have aready been successfully developed in recent years. But for the present purposes, the question of orthogonality pertains to different living cellular entities themselves, in relation to each other. In complex ecosystems such as soils, a vast array of different organisms may closely share the same environment, and it is virtually impossible for them to ‘ignore’ each other. This would seem to be a logical proposition even before performing experimentation, since it would be appear unlikely that different organisms (at least of the same life-type) would not compete for at least some basic nutrients. In fact, in recent times much evidence has accumulated for a surprising degree of ‘talk’ between organisms to co-ordinately regulate growth in response to environmental stimuli. This ‘quorum sensing’ certainly occurs among members of the same bacterial species, but remarkably, ‘cross-talk’ across species barriers (and even ‘cross-kingdom’ communication) has been reported. The A:B (or C:D) to A:B-A:B (or C:D-C:D) indicates copying of a whole templated system, or its replication. Also, A/B and C/D represent distinct molecular alphabets upon which the respective biosystem information transfer arrangements are based. 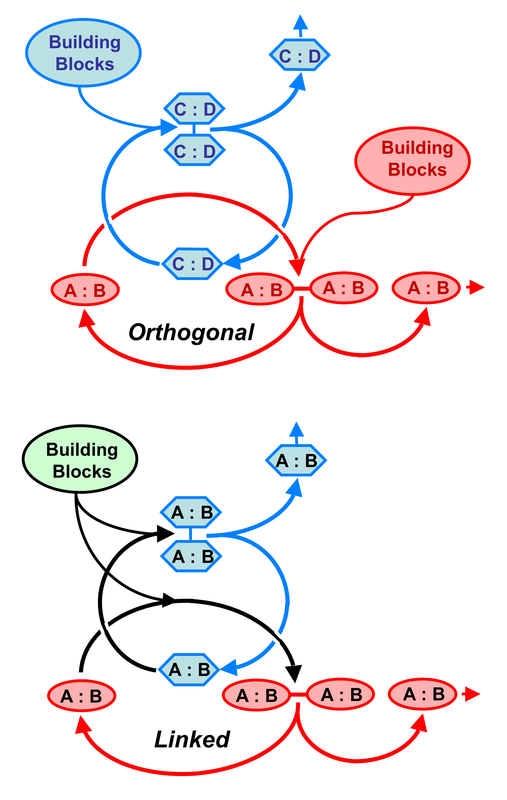 Since the building block source requirements for A/B and C/D are shown as also distinct, the two systems can operate in a shared spatial environment (depicted by the interleaving of their replicative cycles) without significantly impingeing on each other – or in other words, with orthogonality. So in this representation, A/B and C/D could refer to Life-1.0 and –2.0, given their fundamental divergences. In contrast, in a non-orthogonal linked ecology (as also depicted in the above diagram), two or more types of organisms share the same basic biosystems and molecular replicative alphabets (A/B here) and similar nutritional source requirements. Note that this common linkage at a very basic level does not preclude different organisms from assuming very different mature states (represented here by alternate colors and shapes), just as the common fundamental molecular heritage of all Life-1.0 organisms does not inhibit the incredible diversity of life we observe in the world today. But in reality, this theoretical dichotomy is unlikely to be so simple. To consider this further, it’s interesting to go back to the original inspiration for biological dark matter, the world of physics. Long before cosmic dark matter made its entry into physical theory, it was well-appreciated that certain subatomic particles rarely interact with normal matter and were hard to detect. The classic case in this regard is the neutrino, which is literally everywhere, but whose interactions with normal atomic nuclei are statistically vanishingly rare. Yet even exceedingly rare events do not equate with ‘never’, and such neutrino-mediated events can be detected with the correct measurement approaches. While dark matter itself is hidden through the dearth of its dealings with ordinary matter, it too reveals itself through gravitational interactions. So it would not be correct to refer to either neutrinos (and other ‘ordinary’ but elusive subatomic particles) and dark matter as ‘orthogonal’ to the normal universe. Indeed, a truly orthogonal particle would be (by definition) interactionless – a ghostly entity impossible to disprove by physical means. The only utterly orthogonal physics might lie in theoretical alternate universes (as in the ‘Many Worlds’ interpretation of quantum behavior originally propounded by Hugh Everett III), where theory forbids any form of informational transfer between separate offshoot universes. So in this case, even though an inconceivably vast host of such hypothesized universes are in some sense ‘side-by-side’, they are forever and inexorably orthogonal to each other in its most absolute meaning. But this notion is only based on an aspect of quantum theory, which is by no means universally accepted among physicists. Back at the mundane level of the normal universe, where we are merely considering alternative life-types, absolute orthogonality within the same environment may also be something a ghost. This is logically the case from the very obvious fact that both Life-1.0 and –2.0 organisms do share the same universe – if sharing a common physical environment, they must compete for certain material resources at least at the most basic level of mineral and small organic nutrients. And it is this point which will be continued further in the next post, where the important issue of stereochemistry is considered. Could organisms which are ‘mirror images’ of each other in molecular terms at least approach the condition of orthogonality? Which we simply have missed? ‘….the prominent physicist and author Paul Davies….’ There is a long-standing tradition of physicists who became interested in molecular biology, with important figures of the 1950s and 1960s such as Max Delbrück and Seymour Benzer coming to mind. Earlier still, the renowned quantum physicist Erwin Schrödinger published a short but seminal book questioning the molecular nature of biology. ( What is Life? Cambridge University Press, 1944). ‘….what kind of ‘signatures’ a shadow biosphere might leave….’ This is presented in Davies et al. 2009. ‘….also discussed by Paul Davies in one of his popular books.” Exchange of planetary material between Earth and Mars was discussed in The Fifth Miracle – The Search for the Origin and Meaning of Life. Simon and Schuster 2000. ‘….conventional (albeit extremely hardy) organisms can exist in surprisingly challenging environments at considerable depths in the Earth’s crust….’ A significant paper by Thomas Gold in 1992, and a later 1998 book of the same title (The Deep, Hot Biosphere) discussed this issue. Note that organisms living in such environments are removed from the possibility of photosynthesis and are necessarily ‘chemolithoautotrophs’, surviving on chemical energy sources. For a review on extremophilic organisms, see Pikuta et al. 2007. ‘….when looking down a microscope at a mixed population of soil bacteria, one might be eyeballing some weird (but rod-shaped) Life-2.0 exotica, yet never know it.’ Note that for conventional microscopy, it is necessary to stain bacteria with special reagents in order to visualize them (the classic case being the Gram stain, which is still used to differentiate ordinary bacteria into Gram-positive or Gram-negative groups). So if Life-2.0 organisms were visible at all under the same conditions, it would have to be assumed that they would also stain – which might be an unwarranted assumption. For the publication describing the putative arsenic organisms GFAJ-1 and other details, see Wolfe-Simon et al. 2010. For the origin of “GFAJ” see an article in the Wall Street Journal. With respect to the taxonomic classification of GFAJ-1, Wolfe-Simon et al. (2010) identified it as a member of the Halomonadaceae family of Gammaproteobacteria through 16S RNA phylogenetic analysis. ‘….had previously been shown to accumulate arsenic….’ See Takeuchi et al. 2007. ‘…various details regarding the experimental approach of this study have also been questioned.’ For details of the controversy, see a commentary in Nature, and an interview with Felisa Wolfe-Simon in Science, both in late 2010. For more comments, see the blog of Rosie Redfield, which has attracted much attention (and is cited in the Nature and Science commentaries). ‘….a point made by Steven Benner….’ The Benner criticisms of the GFAJ-1 paper were noted in the Nature commentary on the general debate (Katsnelson 2010). ‘….this kind of orthogonality might seem like a tall order…’ For further information on bio-orthogonal chemistry, see Jewett & Bertozzi 2010. ‘…‘quorum sensing’ certainly occurs among members of the same bacterial species…’ For a review of quorum sensing, including cross-kingdom communication, see Williams 2007. Interestingly, from the point of view of a previous post, in the introduction to this paper he refers to recent developments in the understanding of quorum sensing as a ‘paradigm shift’ in studies of unicellular bacteria. ‘…classic case in point in this regard is the neutrino…..’ And a classic popular treatment of this topic, which remains relevant and very readable today, is an Isaac Asimov title: The Neutrino – Ghost Particle of the Atom. (First published in 1966).